Modelling of screw compressors using Computational Fluid Dynamics (CFD) offers better insight into the working chamber of twin screw machines when compared with chamber models. As shown by authors in earlier publications, CFD models predict performance of dry gas and refrigeration compressors fairly accurately. 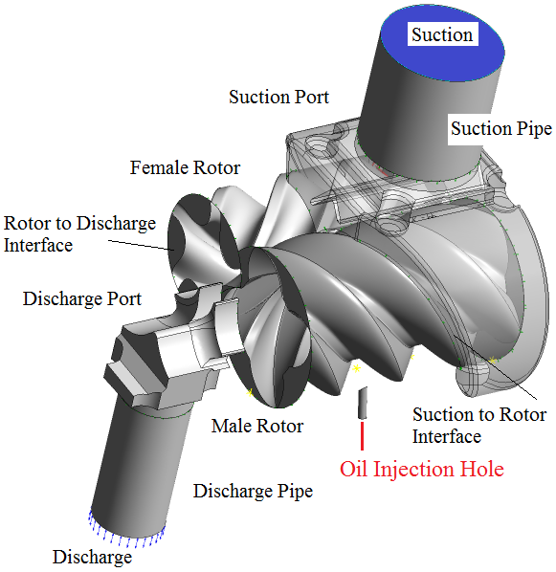 However numerical flow models used for modelling of oil flooded twin screw compressors are still at the development stage. This is mainly due to the lack of understanding of the flow complexity and the techniques used for solving coupled equations that represent interactions between the gas and the oil in such machines. This paper presents the modelling approach used for calculation of the performance of an oil flooded screw compressor. It requires a structured numerical mesh which can represent all moving parts of the compressor in a single numerical domain. Such mesh is generated by SCORGTM using novel boundary distribution technique called casing-to-rotor conformal boundary mapping. 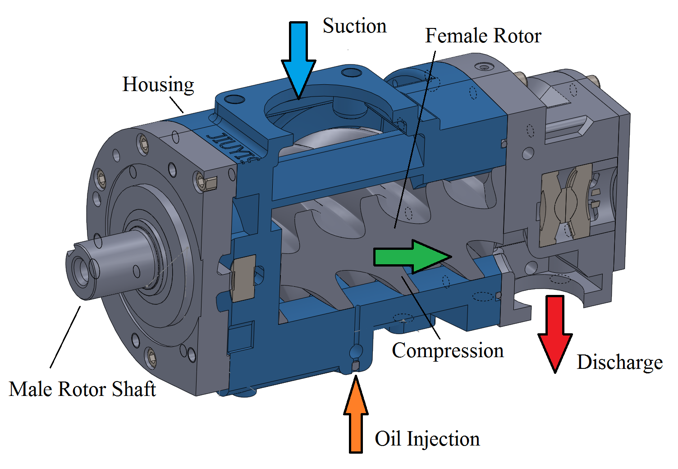 A test oil injected twin screw compressor with rotor configuration 4/5 and 127 mm main rotor diameter was measured in the compressor rig of the Centre for Compressor Technology at City University London. 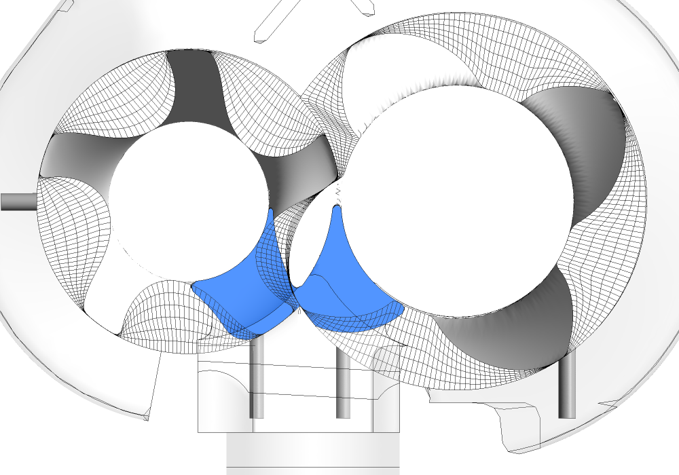 Measurements of the chamber pressure history and integral parameters of the compressor such as mass flow rate of gas and oil, indicated power and temperatures are used for the comparison with CFD results. The analysis showed a close match in the prediction of the mass flow rates of gas. The indicated power obtained by CFD predictions matched well with the measured shaft power. The model provided an exceptional visualization of the interaction of gas and oil inside the compression chamber. The mixing of the phases, distribution of oil, heat transfer between gas and oil and also effects on sealing due to high oil concentration in leakage gaps were well captured.